Unicycle Rose: The other "Pin It"
The term "Pin-It" piggy-backs the website Pinterest. The past month we have experienced a different sort of "Pin It." There was Benson's fourth birthday party at a bowling alley. 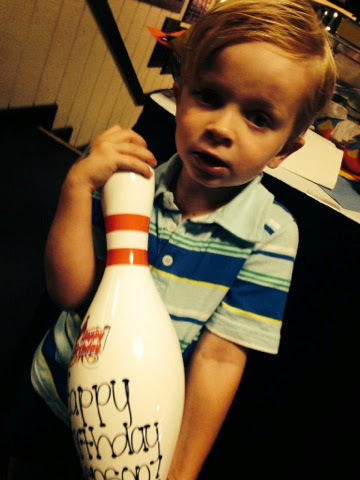 This kid loves to bowl and he is darn good at it! 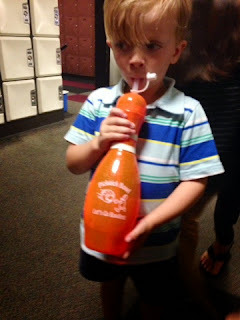 This birthday was "All Things Bowling"...even the party favors! The other "Pin it" in our house is Daniel's arm with those pins that were recently removed. Never having seen anything like this, I was fully present when the cast was sawed off and pins exposed, sticking out his arm. It was mildly gruesome, so I will spare you the photo. 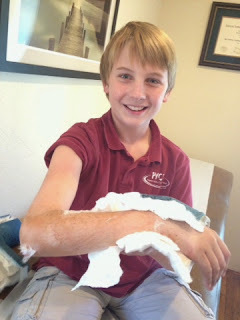 Daniel's arm was much smaller than the beginning of the summer when he was paddling on his surfbard and climbing trees! It will take some time to recover fully. For now, we are focusing on healing, and as of now he is at the 60% mark. Once "Little Arm" (a good Indian name, no?) was exposed, the doctor took a pair of pliers. This set of pliers was no "medical instrument". It was exactly what you have hanging in your garage, sans the rust. 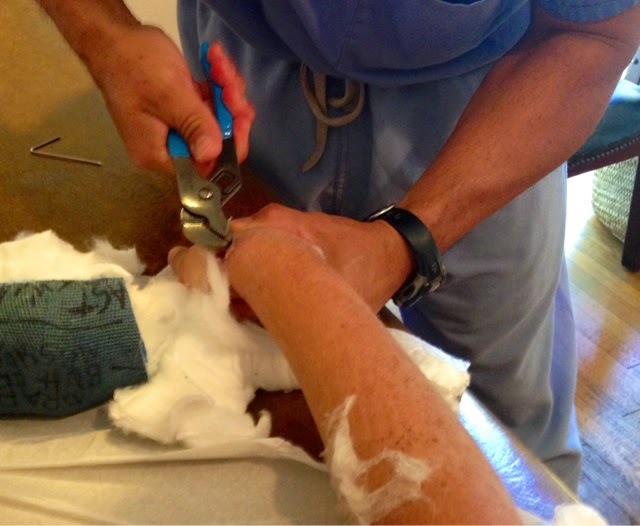 I was surprised ... especially after watching the fancy saw that cut off the cast and complexity of pins sticking out that were surgical placed. Enter garage pliers, stage left. When Daniel saw the pins, I thought he'd pass out. He shrieked into the wall like he saw a ghost. This was gross, but interesting. Well ... that Doc got a strong grip on those Home Depot pliers and the first pin slid out. The next one seemed stuck. The Doc really had to work it, twist and pull to finally dislodge it. Of course, Daniel was shaken up - the only word I can describe the scene was "traumatic." At least, it all went quite fast and it's behind him. PTL! The first pin is behind the Doc in pic, upper left. He gave us the pins when it was over. The Doc went on and on how great Daniel did, explaining there's been two times he had to stop mid-pull because the child was uber-freaking out. 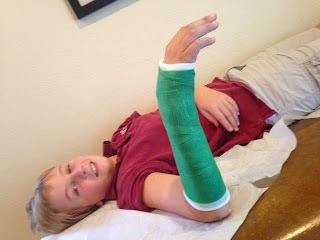 The Doc tried again -- this time outpatient with anesthesia. Boy, am I happy that was not us! The good doctor gave Daniel time to recuperate and then the final stage began. THE short cast he has waited for since August 11 was next!! He decided to go green, and a new cast was formed. Wellah! 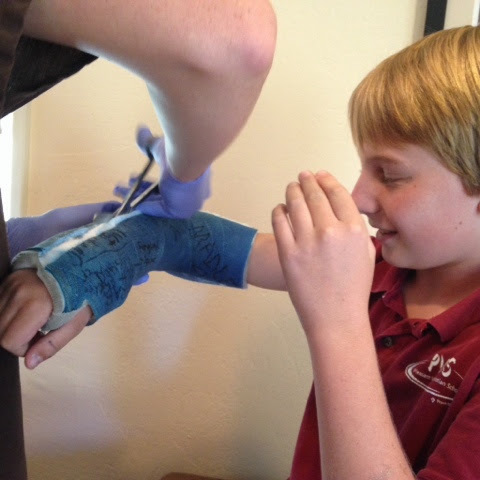 Surprisingly, Daniel can't put his arm down. It has been at a 90 degree angle for so long it is stuck that way. It will take weeks for that to change. He still walks around holding his arm up, as if in a sling. Give it time.